Thanks to research and technology, there are now a lot of ways to relax. One of the best ways to do so at home is with a hot tub. One of the more recent kinds of tubs available features the use of salt water instead of the more conventional chlorinated water. In this article we discuss saltwater hot tub pros and cons. We take a closer look at this kind of apparatus to see if it is worthy of being a good alternative to the more traditional style tubs that are being sold in the market. What is a Salt Water Hot Tub? Before getting into the advantages and disadvantages of salt water hot tubs, we want to explain what exactly these devices are. This way you’ll be able to understand why they’re different from the regular tubs we often see being sold. Developed in the early 1980s, these kinds of tubs don’t use chlorine like regular tubs do. Instead they use salt in the form of sodium chloride or bromide, depending on the model you get. These devices are equipped with a salt water system that continuously converts small amounts of salt into chlorine to sanitize the tub. This way you don’t need to maintain the tub using chlorine. It regulates it for you. Many people are familiar with the traditional chlorinated hot tubs. However, people are slowly getting to appreciate the fact that saltwater hot tubs can make a good alternative to the chlorinated hot tubs. The different technology used with salt water tubs lets you avoid the negative effects of using chlorinated hot tubs. Some of which including burning eyes and dry skin. Well, as with all products, saltwater hot tubs have a number of advantages and disadvantages. And we lay them out here so you can make a more informative decision on whether or not to get one. One of the advantages of using saltwater hubs is that there are minimal effects of chlorine. Saltwater is a natural sanitizer and not too much chlorine is needed to disinfect the water. With saltwater tubs, a chlorine generator converts salt water into chlorine. Salt water hot tubs therefore provide more comfort because there is less chlorine. This means that the various effects of chlorine are not largely felt. In addition, the chloramines in the generator are broken down much faster. As a result, there are fewer damages to expect on your skin. This is to say that one is less likely to suffer from itching, dry skin, green hair and burning eyes. Salt water hot tubs therefore ensure that one maintains a healthy skin. In fact, salt is an ingredient in many of the skin care products. Another advantage of saltwater hot tubs is that you will need less time to maintain the cleanliness of the water. This is because of the steady supply of chlorine from the generator. The steady stream of chlorine reduces the accumulation of fungi and algae. This is unlike with the chlorinated tubs, where one has to treat it regularly to ensure the chlorine levels remain at the optimal level. Moreover, salt water hot tubs allow the owner to save on the costs of buying and storing chlorine. 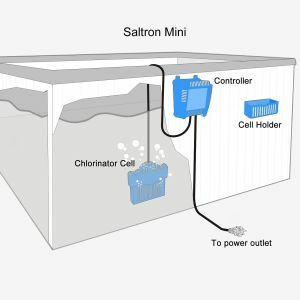 The owner does not have to handle chlorine directly because the chlorine is generated from the salt water you put into the tub, which the salt system generators processes. Owners therefore not need to add chlorine from time to time. Thus, saving time, money and effort. 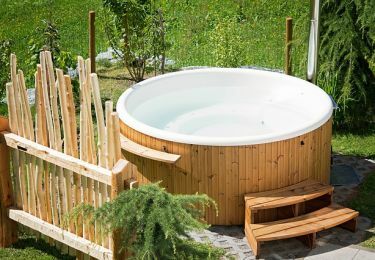 In addition, saltwater hot tubs help in relaxation and reducing swellings in the body after exercises. It is said that hot water helps in the opening of the pores on the skin while the salty water helps to draw fluids out of the skin. As a result, this helps in the treatment of swelling and aches. Similarly, salt water hot tubs are effective in relaxing physical and psychological tension. Hot water is known to relieve muscle tightness and the jetting of water helps in loosening the muscles. This is why athletes use hot tubs to relax their muscles after exercises. On the other hand, there are some cons of using saltwater hot tubs. There are a few other advantages of saltwater hot tubs including cleaning and maintenance. We’ve added a video below that explains so of these pros. As with all things there are disadvantages to these kinds of tubs as well. And here are the essential ones. One of the main disadvantages of saltwater hot tubs is that their initial cost can be quite expensive. This is because you will need a generator to convert the salt water to chlorine. It is quite expensive to buy this kind of generator especially when the capacity is quite high. Moreover, the salt generator will require electricity to run which increases its running costs. Another disadvantage of salty water hot tubs is that the owner must carry out regular maintenance. Generally, we know that salty water is corrosive. Exposing the metal parts and components to salt water therefore puts them at the risk of corrosion and must therefore be replaced from time to time. Salty water is said to be harmful to the soil. Too much concentration of salt in the soil will inhibit growth of plants. Moreover, salty water can rob the soil off its nutrients and therefore the salty water hot tubs are not friendly to the environment. Fitness, General Health, Weight Loss. permalink.